Sidewinder rattlesnakes (Crotalus cerastes) are venomous snakes native to the deserts of southwestern U.S. and northwest Mexico. Three subspecies exist, distinguished by differences in appearance. 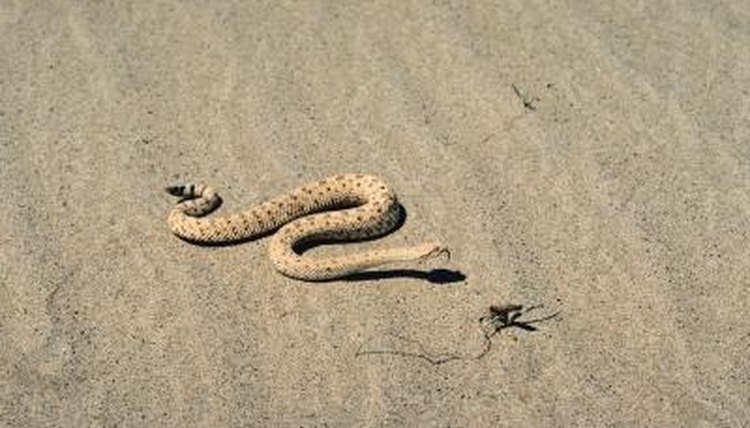 Mohave desert sidewinders (C. cerastes cerastes) have 21 rows of scales along their backs, and the rattle segment closest to their bodies is brown. In Sonoran desert sidewinders (C. cerastes cercobombus) this rattle segment is black. Colorado desert sidewinders (C. cerastes laterorepens) also have black rattle segments but have 23 rows of dorsal scales. Sidewinder rattlesnakes typically mate every year, although if prey is scarce females sometimes skip a mating season. Most mating takes place between April and May, although the season extends through the middle of summer. Female sidewinders may mate with more than one male in the same mating season. Sidewinders are solitary creatures, only coming together to mate, and male sidewinders play no further role in the reproductive process. Pregnant females carry their young inside their bodies for two to three months before giving birth. Rather than laying eggs as many snakes do, female sidewinders retain the eggs inside their bodies until they hatch and then give birth to live young. Sidewinders burrow underground and give birth in a natal burrow, typically in litters of between 5 and 18 young. At birth, sidewinders are around 7 inches long and don't have a rattle at the end of their tails yet. Newborn sidewinders stay in that burrow for up to a week, although they receive no further parental care during that time. After the first week or so, the young sidewinders leave the nest and go off on their own, living the rest of their lives primarily in solitude. Young sidewinder rattlesnakes eat mostly small lizards. Sidewinders gain a new rattle segment each time they shed, so juveniles don't have much of a rattler. They wiggle their tails to attract prey, biting with their fangs once the animal is within striking distance. As they grow older and gain more rattle segments they abandon this method, preferring to ambush their prey. Sidewinders reach sexual maturity at around 2 years old. Adult sidewinder rattlesnakes reach lengths of between 17 and 33 inches. They are active primarily at night or in the early morning hours, avoiding the midday desert heat. Sidewinders have large triangular heads with enlarged scales over their eyes that look like horns. Since snakes don't have eyelids, these scales fold down over sidewinders' eyes to protect them when they are burrowing underground. As adults, their diet expands to include small rodents and birds. Their coloration ranges from pale cream and tan to grayish black and acts as camouflage by mimicking the color of the desert sands. Sidewinder rattlesnakes live up to 10 years in the wild, and can live 20 to 30 years in captivity.